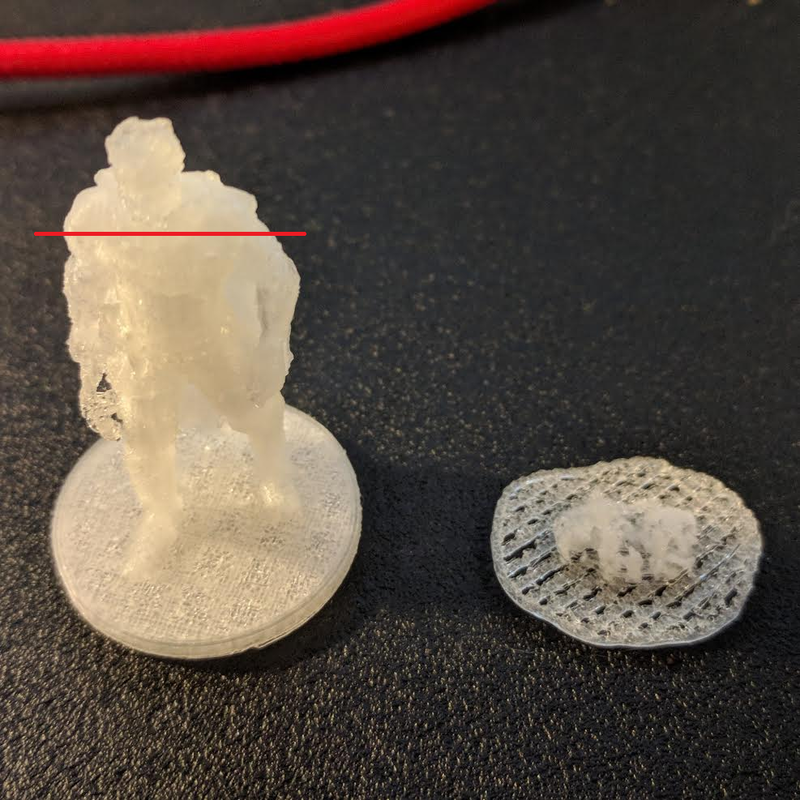 Minimal extrusion before retraction option removed? Posted November 20, 2017 (edited) · Minimal extrusion before retraction option removed? I am trying to slice up a model with Cura 3.0.4. The model is of a humanoid and total height is about 3cm (~1in). As the result of overall dimensions, the head is quire small. When I print out the model sliced with Cura, the body comes out quite frail and the head is non-recogniziable. I think it may have to do with the retraction while printing the head. I also have an older version of Cura, with which I am able to successfully make the print (seems there wasn't a good support for pillars and one overhand just gets messed up). I would like to transfer configuration from the old to the new Cura. 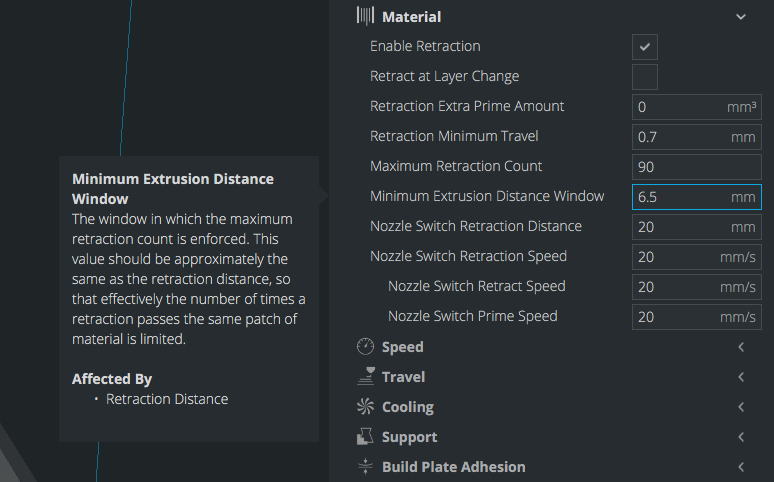 However, I am unable to find "minimal extrusion before retraction" configuration option. Has it been removed? If so, was it replaced with something equivalent? I will have another go at the print and will attach photos for more context. On the left is a model printed in older Cura but without support column. However, the model itself looks ok. The model on the right is just the bust of the model on the left (starting with the red line). I stopped the build early as it was apparent that it wasn't going so well. As you can see, There is no definition of the walls. Seems just like clumps of matterial. 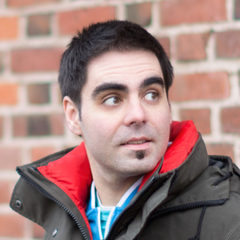 I am using Maker Select V2. PLA configured as Monoprice PLA. Base printer was taken as Prusa i3. 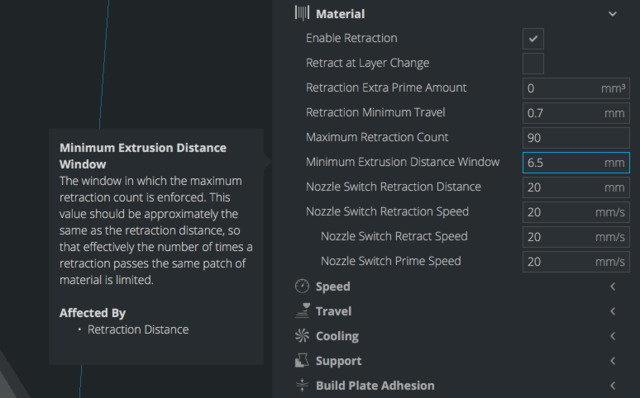 Posted November 20, 2017 · Minimal extrusion before retraction option removed? I think this would be the closest setting for what "minimal extrusion before retraction" - I didn't test it though.